Bertrid Barrett (Service No 3894) was born in Hobart, Tasmania, around 1888. In 1911 he married Ellen Ryan in Wollongong, N.S.W. 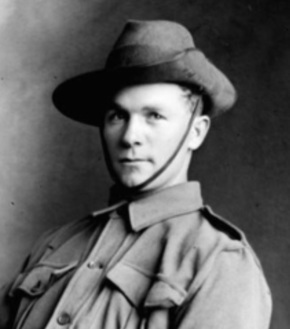 At enlistment Bertrid was 27 years old, worked as miner and lived in Balgownie, N.S.W. He embarked from Sydney on RMS Mooltan with 1st Battalion, 12th Reinforcements on 11th December 1915. After arrival in Egypt he was transferred to 53rd Battalion Headquarters. Bertrid arrived in France on 29th June 1916. With the 1st Battalion he took part in the Battle for Fromelles on 19th/20th July. He had a number of hospital admissions and behaviour issues after this time. On 22nd August 1917 he injured his left knee when he fell off the guard house table. Bertrid was returned to Australia in December 1917 and discharged medically unfit due to knee injury on 13th March 1918. A pension was granted to him, his wife and a child on 14th March. In 1923 he left his wife and 3 children and eventually ended up living in Cessnock where he died in 1971. Bertrid's service is commemorated on the Balgownie War Memorial.